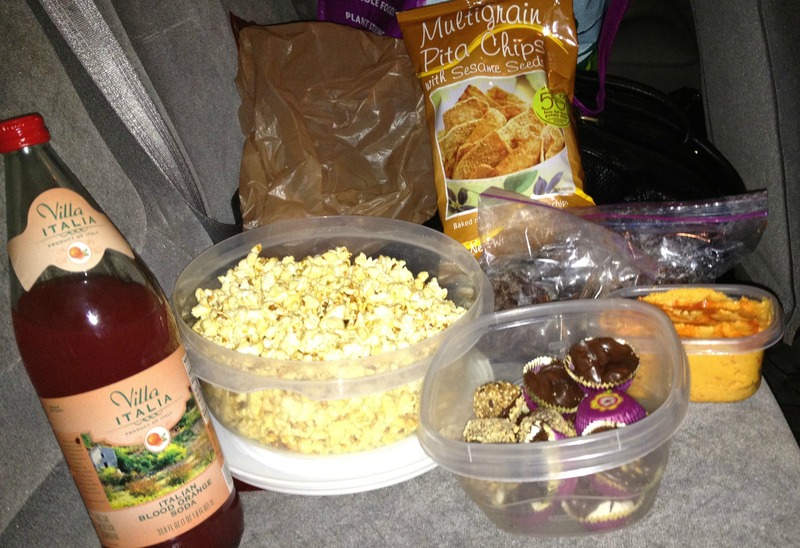 Last weekend, Melinda, Amelia and I went to see Brave/Spiderman at the Drive-In. I knew I was in good company when the first thing Amelia and I said when we finally had plans nailed down was “I can’t wait to make treats!”. I love hanging with fellow foodies. So, of course, store bought treats would not do for us. Oh no! We had to all make our own, of course! And everything came out delicious! We had a nice spread of buffalo hummus courtesy of Amelia (who hasn’t sent me the recipe yet so I can’t share it with you…*hint hint Amelia) with pita chips and veggies, dark chocolate covered pretzels and peanuts, popcorn popped on the stove with a little olive oil and spices courtesy of Melinda (super good! Melinda did send me that recipe and I have made it so you may end up getting that one…) and, of course, italian blood orange soda because regular soda wasn’t pretentious enough for us! lol! Besides an incident where there was a little fight over the pita chips (“Melinda! If you don’t turn around and buckle up, I’m pulling this car over!! ), our food went over splendly. 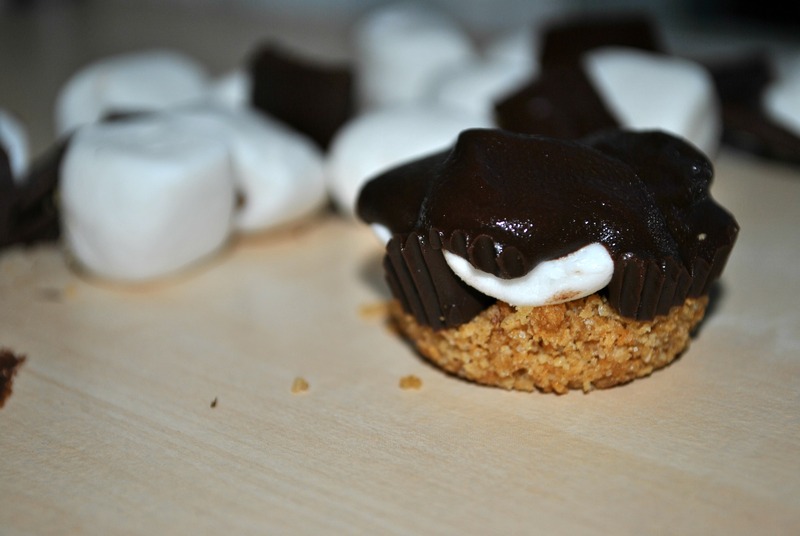 Included in my contributions were these s’mores cups. I’ve been on a obsessive s’mores kick lately so it’s always good when you can find a way to bring them on-the-go! Line a mini cupcake pan with mini cupcake liners. Place the graham crackers in the food processor and process until they are fine crumbs. Pour into a bowl. Add the melted butter and sugar in with the graham cracker crumbs and mix until well combined. 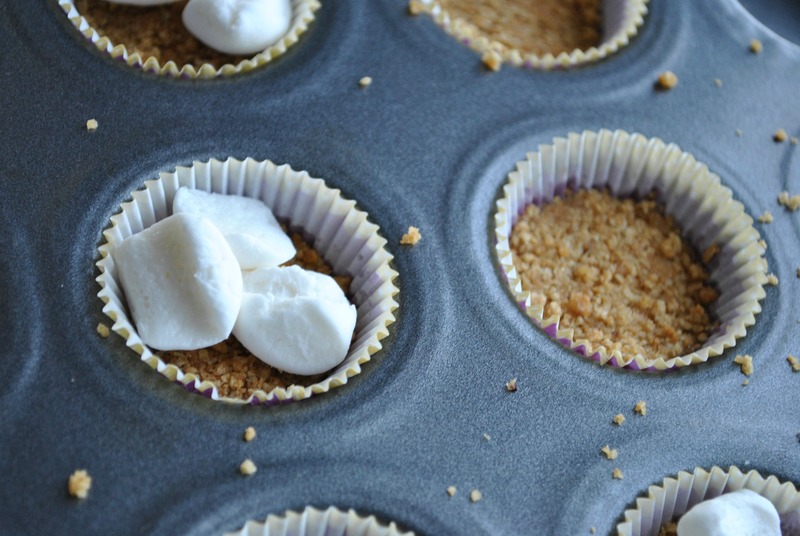 Pour about a spoonful of the graham cracker crumbs into the mini cupcake liners. Pack the crumbs down with your spoon. Your cupcake liner should be approximately half full. 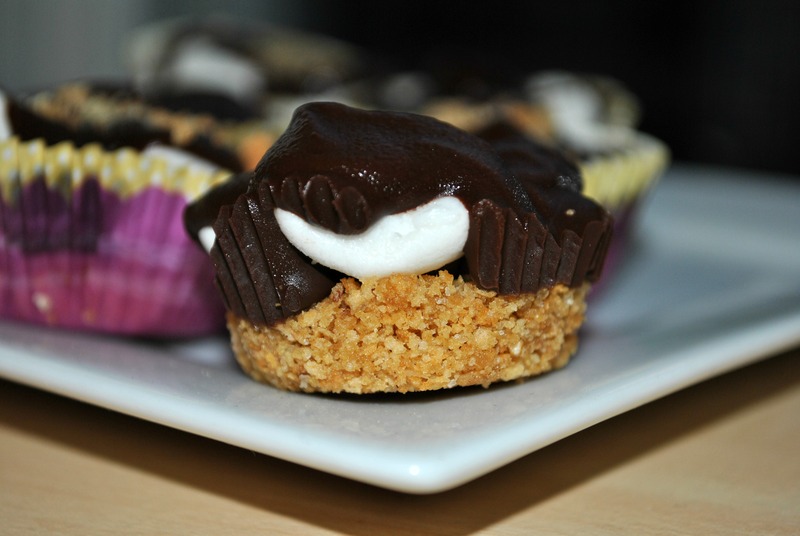 Place three marshmallow pieces in your cupcake liners on top of the graham cracker crust. Using a double boiler, melt your vegan chocolate chips and vegetable shortening (and pb, if you are using it). Spoon melted chocolate over the marshmallows. Place in fridge to chill. Best served cold. My favorite way to eat a s’more is with a thin layer of peanut butter. It’s so good! So I melted some PB in half of my chocolate. I did nine s’mores cup with regular chocolate, melting about 2/3 of the bag of chocolate chips with just vegetable shortening, and then melted the remaining 1/3 of the bag with a big scoop of peanut butter and a little bit of shortening for the remaining 9. I honestly can’t decide which version I love more. Have a great weekend, everyone! The sun totally won in our war at Warped Tour and I walked away red as a lobster. So I will definitely be nursing my sore skin this weekend. I hope you do something way more fun that that! !